I have been attempting to live the #NSNG lifestyle for almost a year now. Recently, I have been browsing Pintrest, trying to find new and exciting recipes to try. When I search for recipes, I want to find ones that I can make NOW!!! I usually open up my fridge and ask myself “What can I do with all this Kale?” I have no idea what I was expecting to come up with. Kale Doughnuts, or Kale Cookies? I wanted some magical recipe that instantly made kale sound exciting. However, after the search was made, the truth came out that there was no magical recipe. What did come up, was recipes that I have already heard of…And lots and lots of recipes for Kale Chips. Disappointed in my failed search, I reluctantly clicked on a pin for Kale Chips. Numerous bloggers compared eating Kale Chips to potato chips. I do not know what secret spice these cooks are sprinkling on their kale chips, but I highly doubted that the end result was comparable to potato chips. Eager to prove the bloggers wrong, I decided to whip up a batch and see for myself how awful they tasted. I plucked off the leafy parts from the thick stem and ripped the leafs into smaller pieces. Then I added about 2 Tbs. of Fat Louie Olive Oil to the Kale and mixed it until every piece was saturated in the oil. 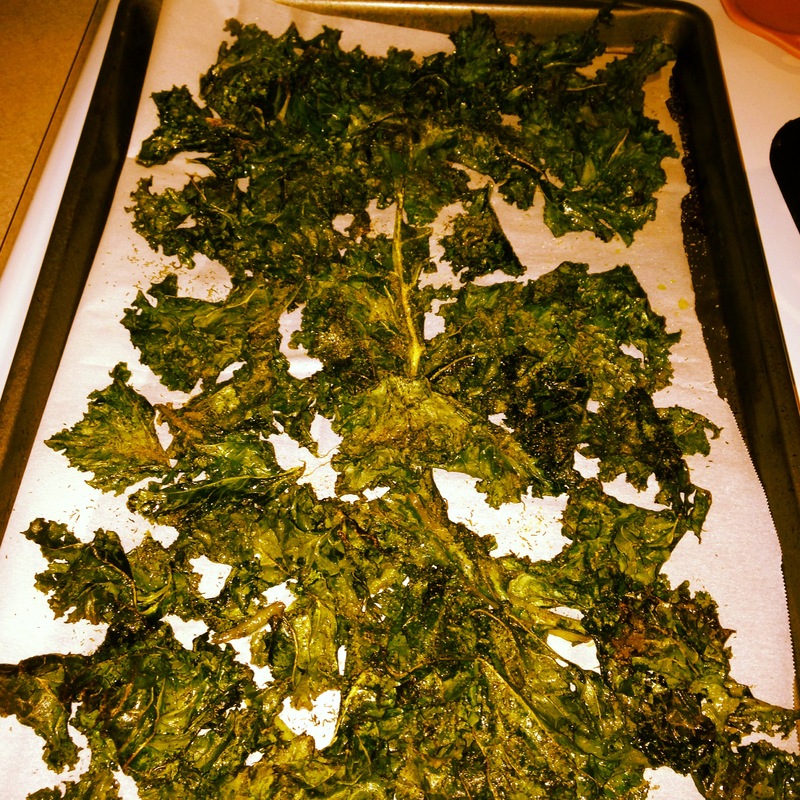 I then spread out the Kale on a cookie sheet lined with parchment paper and seasoned the Kale. Lastly, I placed the Kale into the oven at 250 for 30 minutes. Finally, the buzzard broke the silence of my kitchen. I was surprised, because the Kitchen actually smelt good. For about a minute, I just stood by the oven, trying to decided if this was a good idea. Reluctantly, I grabbed a small piece that looked like it got seasoned well. Now, I will not compare these to Potato Chips, but this was actually tasty. Because the kale is baked at a low temperature for a longer amount of time, the water seems to dry out of the kale, leaving a dry crunchy snack. Season the Kale to your preference and you have yourself a tasty alternative to eating junk food. I dare you to try this for yourself! Chop up kale into bite size pieces. Add olive oil and toss in kale until everything is completely covered. Spread evenly onto a cookie sheet lined with parchment paper. Combine spices and sprinkle evenly onto the kale. Make sure to only have one layer of kale on the sheet. If you have too much Kale, it will not dry out and will be left soggy. You can be creative and season the kale with your favorite seasoning.